Well team yall have gotten me thru that obstacle. What advice can u give me on my offset. So I have completed the Henderson Driving Academy. I came out to Henderson on Sept. 14 2015. When you first get there you do your orientation, DOT Physical and drug screen. It is all done on the Monday that you arrive. 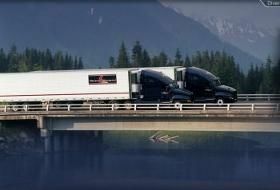 Then from Tuesday thru Wednesday you study for your CDL permit and then on Thursday you go to the DMV and take the Illinois written driving test and the CDL test which includes, general knowledge, air brakes, and combination vehicles. Once you have past you will spend 4 weeks in the yard practicing straight backing, off set backing and parallel parking. Also thru out your weeks in the yard you will do on the road driving to practicing your shifting and controlling a tractor trailer on the road with other vehicles. Then they will take you to the DMV and you will do your CDL test. Once you complete the yard training and receive you CDL you will do 6 weeks with a driver trainer and get paid while your with your driver trainer. Sounds easy but if your not use to driving then it can be stressful some days. The instructors are great and very motivated. It took me a little longer then for weeks to get my CDL but at the end of the day I got them. Its a great driving school to go to especially if you can not afford the upfront out of pocket cost. Once you get behind the wheel and start driving with your trainer then you began to pay back $50 a week for 52 weeks as long as you stay with the school the whole first year. Pick a point (mark) that you can use every time and start coming out of the turn at that point. What worked for me was coming out of the turn when my exhaust stack was even with the corner of the trailer. Yeah i have some references on my trailer that i have been taught. It just makes me think that the parallel is gonna be even harder if i dont master this offset. Been reading up a lot on this an one other trucking forum. So thankful for all the articles, experiences, and information that is available. Everyone here is great. My wife and I are in our 40's...contemplating being team drivers. I drove for 3 years for FedEx Home delivery, but never over the road. I have a class B. license and doing some part time bus driving now. I mention the FedEx driving because I know what it is to be out in a vehicle for 12+ hours a day. I am by no means saying that compares with otr drivers. We are looking at what might be the best possible route for us to take to get CDL's and sign on with a company. Because we don't have, or at least won't have any income if we are both in school/training then we need to take a quicker route to school than a Community College which does have a trucking class in our area. I have been researching Central Refrigerated, Prime, and Hendersen...but would really like anyone's opinion on these or any other options. BTW, we live in GA near Savannah. Probably aren't looking to make the change until beginning of next year. Also, we are not tied to this area so we could move/relocate if needed. Just remember, the way they are showing us, do not oversteer. It's easy to do, that was my big problem. Small adjustments, wait for your trailer to react. Ok now its really bugging the **** outta me....who are you. Hey so are u still here at Henderson? Ok fellow truckers and students. Im finally able to nail my straight back and now Im asking for some tips for the offset. Im struggling. When im outside the truck watching others it looks like cake. When I get behind the wheel its like everything goes out the window. They are teaching us a certain way because the way the Illinois DMV is. So we come out of the box after a straight line, hugging the cones on the left side. Turn a slight right and then a slight left so that the trailer is at a very slight angle to the box on the left of us and the tractor is pretty much straight in front of the front barrier cones. Then we are supposed to back straight back slowly as the trailer slowly moves back at a slight angle. That Ive got. Im having a hard time from there. I loose sight of the cone and I feel lost from there. I was way way way oversteering by the sound of it. I know this probably is gonna embarrass the crap out me down the line but I need someone to give me tips on my straight line. My husband is a 10 yr veteran and he said I just need to keep practicing. Seems like i can picture myself doing it but I get in the truck and like my mind wont cooperate. I dont know if its the whole trailer drifting concept or what. Holy freaking paper work george! Some guys seem to have alot more info that i didnt even concider. What info did they have that you did not consider? Just little tips on backing and 90°docking that helped me visionize the maneuver before I am even in the truck. Well I am here. Checked into the hotel this morning at aroynd 2 am. I start tomorrow. Here goes nothing. Or everything rather. Im nervous as ****. Prpbably wont sleep well tonight. Talked to some of the other guys in classes before me. Not real positive about how this all works. Some guys seem to have alot more info that i didnt even concider. I guess all I can do is go in with an open mind and hope that my husband with all his prior expirence will be able to guide me a lil. So hows it going? I just got here to yhe hotel. Start tomorrow. Believe it or not, the people who run into the biggest problems with their careers early on are people who come into the industry with a rigid set of expectations and strong opinions about pretty much everything. They expect to be treated a certain way, trained a certain way, and they think they have the entire process figured out in their head. Then they arrive for orientation and training, find out everything is completely different than they had imagined, and start believing that the company is disorganized or unprofessional. So these student drivers start questioning everything. Why don't I get more time in the truck? Why do they keep changing our schedule around? Why aren't the instructors spending more time with us? Why do we spend so much time waiting on things? Why aren't they sending me out on the road sooner? Before long they start getting an attitude and begin confronting the staff and drumming up discontent amongst the other students. Their attitude continues to sour, they get more confrontational with the staff, and before long they're on a bus headed home. Naturally they blame the company for their demise and begin hitting every website they can find to badmouth the company. The best thing you can do is go in with a great attitude and an open mind. Whatever you expect, toss it aside and deal with whatever is in front of you instead. Just roll with it. Do what you're asked to do and do it with a smile. Someday you'll understand why things are done the way they are in this industry but in the beginning it's going to seem baffling. Don't sweat it. Just keep listening, learning, working hard, and do it all with a great attitude. Forum Topics Tagged "Hard Lessons Learned"
Thanks for the words of advice guys. I really dont know what to expect. All I can do is walk in there as humble as I can and absorb what Im being taught. Hey yall. Here goes. On our way to O'Fallon IL to start school for Earl L. Henderson. We are so super excited. Of course my husband has driven before for about 10 years and got out of it for a while and now I am gonna doit with him, so Im a lil more nervous than him. Any calming words of advice for this rookie gal? Deep breaths, stay focused and listen to the people teaching you. I'll be there on the 26th, perhaps I'll catch you guys around the yard. Awesome. Maybe we will see each other. You coming alone? Hey y'all. Here goes. On our way to O'Fallon IL to start school for Earl L. Henderson. We are so super excited. Of course my husband has driven before for about 10 years and got out of it for a while and now I am gonna do it with him, so I'm a little more nervous than him. Any calming words of advice for this rookie gal? Well here goes guys. We are on our way to O'Fallon, IL. We start school on Monday. Totally excited. Any words of advice?